Man, it has been a crazy couple of months. Hopefully I’ll be back to posting regularly now. For the last two years I’ve been working for a video game developer here in Salt Lake City. It was a great place to work for a while, but in the last few months of 2008 things really hit the fan. I won’t go in to details right now, but there are a good number of very angry former and current employees, not to mention the angry families of the employees. The job market for animators in Utah has been pretty flooded lately, making it hard to find work. I’ve spent a lot of time working on new demo reel material, in hopes of snagging a new gig. The late nights paid off, as I’ve just started a new job last week at an animation studio in town. I’ll be doing motion capture for an upcoming animated feature. So, with the stress levels finally under control, I am excited to start posting again. I just wanted to say thank you to everyone still subscribed to my comic. Sorry about the lame update schedule as of late. Things have been a little rough for me lately and I’m not out of the woods yet, but I won’t bore you with the details. Well, skin me alive and call me luggage. I seriously never thought I would see this again. 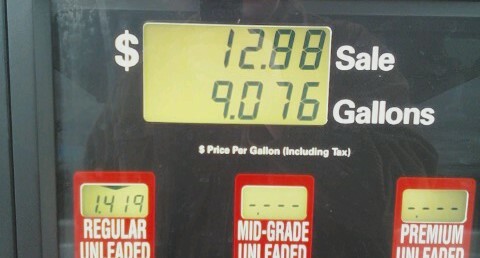 It’s crazy to think that just a couple months ago it cost almost $40 to fill my XB’s little tank. I had to just savor this moment. Also, there will be another comic up today, I just didn’t get to it this morning before leaving for work. I’ve set up a store with printfection.com! I’m offering T-shirts with designs that people have requested in the past, so if there is a particular comic (or specific panel) you’d like to see on a T-shirt, let me know. You can check it out at http://store.channelate.com.